Can you believe it? 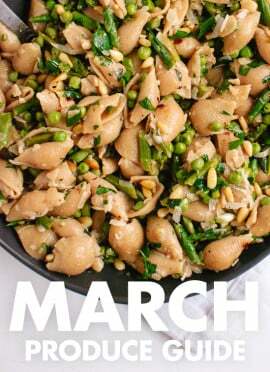 We made it to March. Asparagus is on its way and we’ll finally have more fresh fruits and vegetables to work with this month. You can browse in-season recipes below. Instead of my usual monthly link roundup, I want to tell you about a book that’s very special to me. We lost a bright light when my friend Kirsten Farnsworth passed away last spring. She was lovely and incredible and lived with cancer for six years. In her last months, she wrote a book about her experience called Incurable. The first printed copy arrived in her hands two hours before she passed. It’s not an easy read, but it is heartfelt and raw, tragic, funny, relatable and important. Don’t forget to tag your recipe photos #ckmarch and #cookieandkate so we can all see them! If you’re looking for an ingredient that didn’t make the list, check my new ingredient index for relevant recipes. This makes me so excited for spring as well! I live in Nebraska and have been loving the weather lately; I’m praying that winter doesn’t make a return! 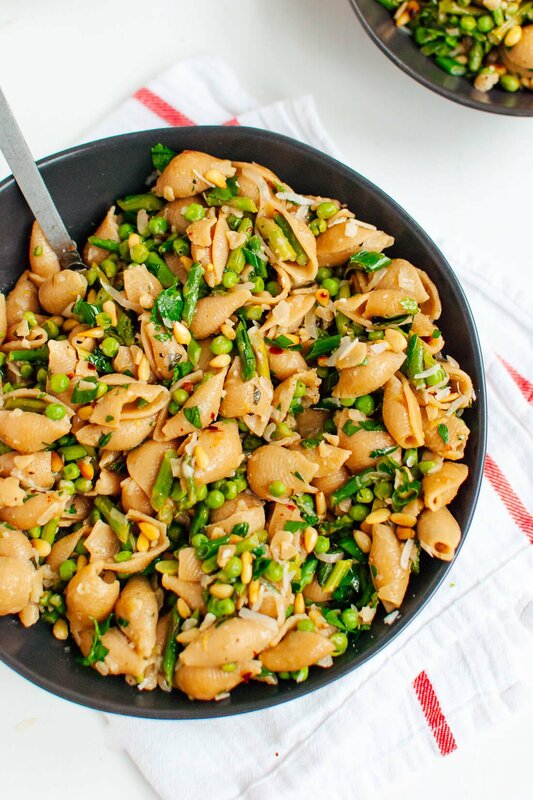 Can’t wait to try the peas/asparagus pasta…that sounds like the ultimate spring dish! I have my fingers crossed for no more cold, gray days! Hope you love the asparagus pasta. 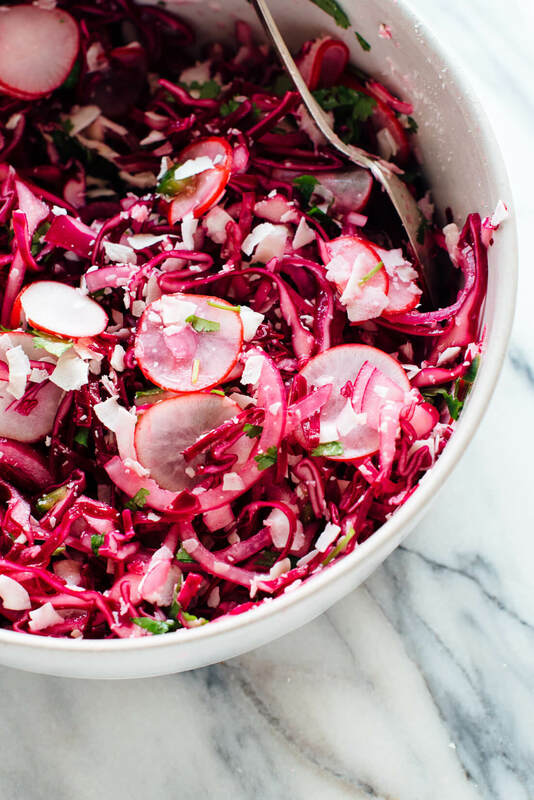 I missed your seasonal produce guides, so these What to Eat features are great! Thanks! Yay, glad you like them! Thank you, Megan. I love this call back to your lists of seasonal vegetables. 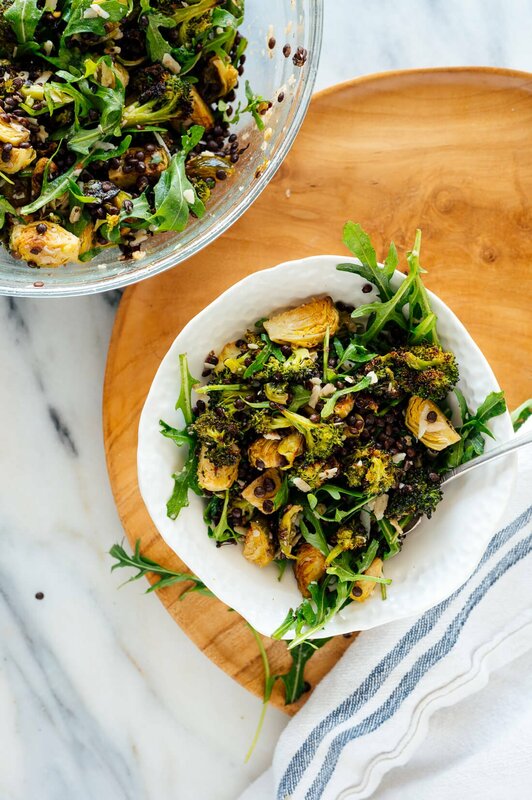 I just made a riff of your roasted broccoli, brussels, and lentil salad (I made it into a grain bowl) partially because I think I memorized your lists of seasonal vegetables last year… slightly embarrassing to admit! Well, I think that is awesome! Your version sounds stellar. I really like these “what’s in season” posts! So glad asparagus is making itself known – means Spring is just around the corner! 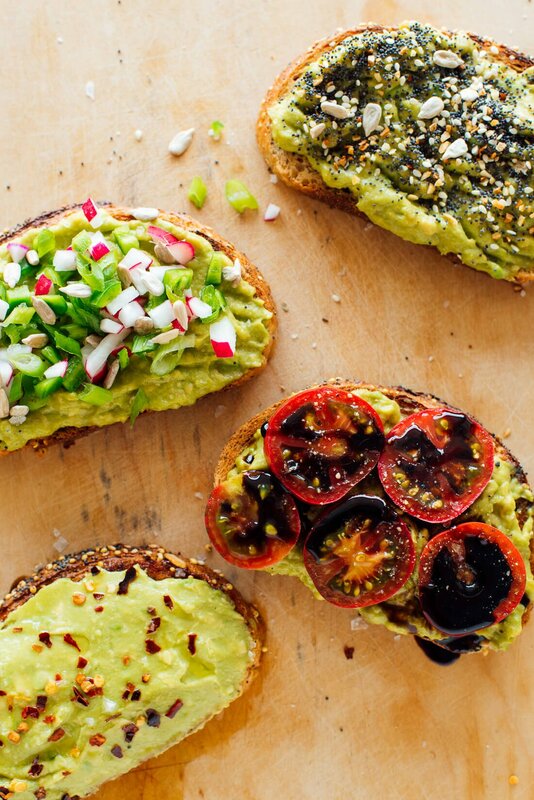 These posts are so inspirational…I want to eat All the Healthy Things now! :o) Thank you! Asparagus and peas! I can’t WAIT. Love this post! 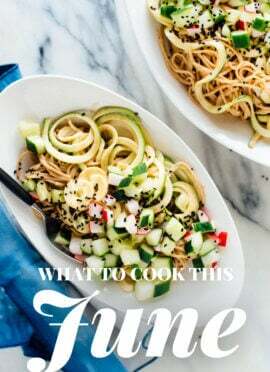 I just came across your blog a few days ago and have enjoyed going through your catalog of recipes… so many great ones to try! I love that you dedicate a post of what’s in season because I never know. Can’t wait to cook up some asparagus! I hope you get a chance to dive into some new springy produce, Carolyn! Those quesadillas look AMAZING! I will have to try them. I think that quesadillas and enchiladas may be my all time favorite meals. So healthy too! Thanks for sharing. I’m obsessed with the enchiladas, too. Thanks, friend! So glad to see green again! Thanks for the wonderful round-up. AH, me too! That special springy green is my favorite. I just pre-ordered the book, and I wish it were May already! It looks great, and I am very excited about it. I started reading your posts a few weeks ago and am enjoying them very much. 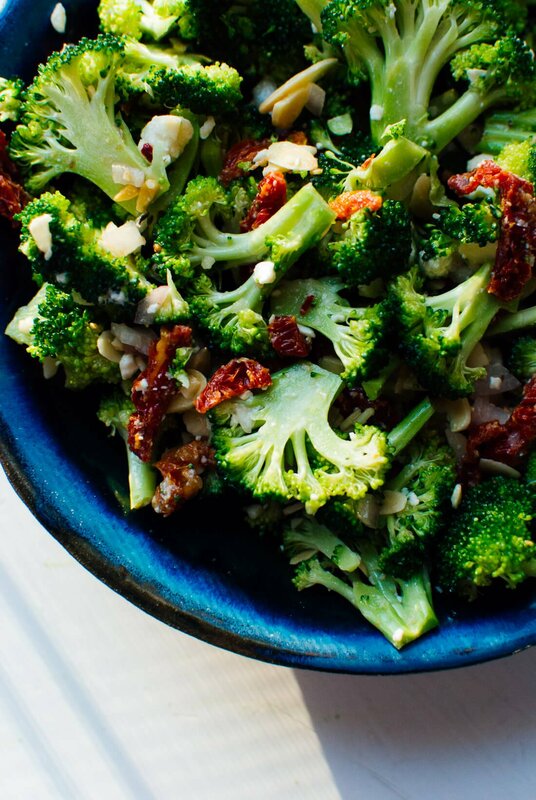 I definitely needed some great vegetable dishes, and you have opened my eyes to a lot of possibilities. I can’t wait to move so I can get everything out of storage and cook more, but who knows when that will be?! Thanks for letting us know about the book. 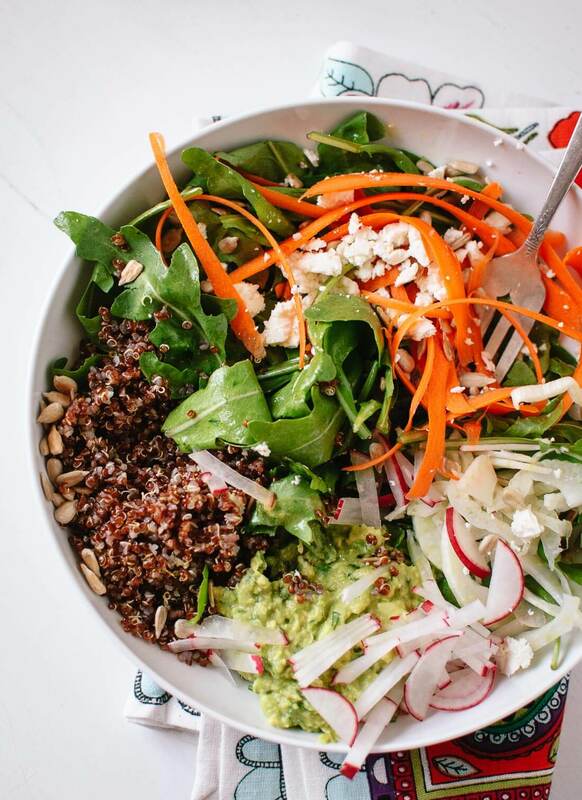 Love that spring brings us some new green veggies to get creative with! 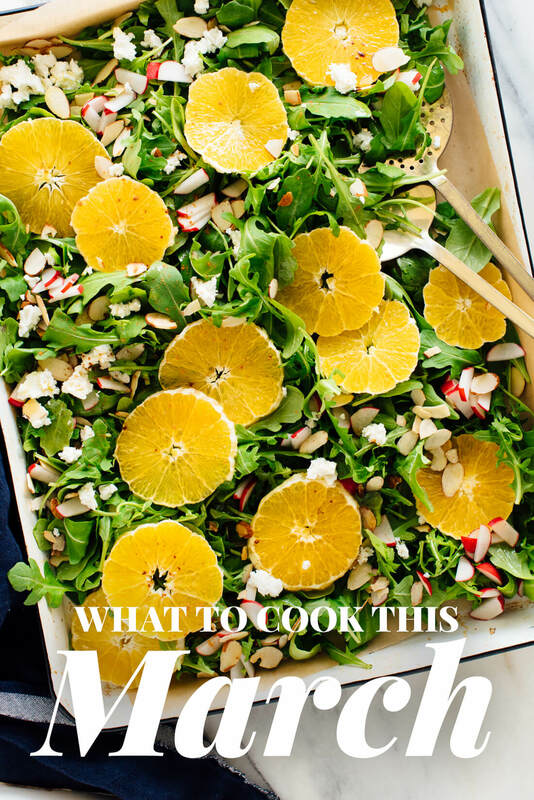 So many great, healthy recipes here! Thank you, Christen! Hope you get a chance to cook one up soon. 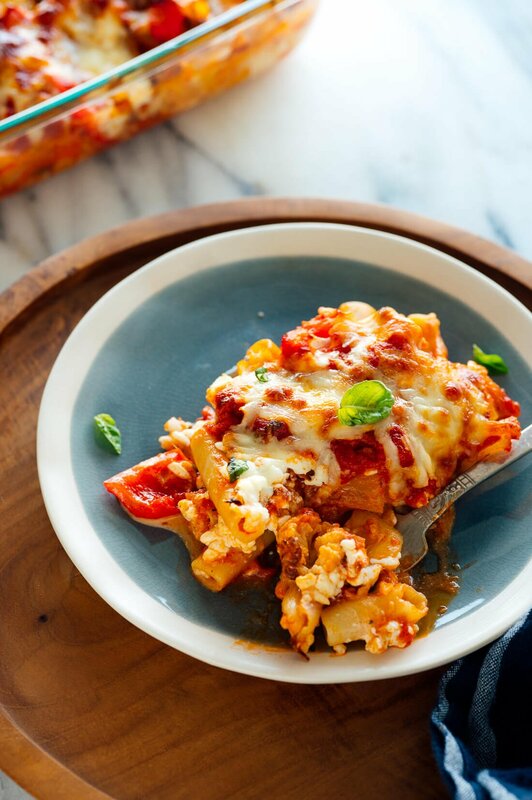 Just ordered the book–as many recipes as I’ve “borrowed” from you over the past six months…it would have seemed wrong not to–and now it will be that much easier to grab a recipe. Dan, thank you so much! Delighted to hear that you’ve been enjoying my recipes lately. I hope you love the book, too! I am so looking forward to your cookbook Kate. I use a number of recipes from your blog. The ingredients are practical and the recipes turn out well. I am looking forward to giving your cookbook to others as a gift. Debbie, thank you! That’s music to my ears. Thank you for sharing my book with others! I don’t have to cook at all this month (my husband is cooking this week, and starting next week we’ll be traveling)!!! However, I’ve saved several recipes, and definitely want to try them. I need to pay more attention to these monthly posts. Yes, I do these seasonal posts each month. I hope you try some of them! Forgot to say that I’ve put your cookbook on my Amazon wish list. The look inside feature is very generous for your book. The book is looking really good, and like one that should be in every kitchen. I appreciate that, Susan! I’m really excited about it. I had a peek at your cook book and it looks awesome. I can’t wait til it comes out. You are inspiring me to cook more often (it’s not my favourite thing)! I also noticed you have a beautiful kitchen! Congradulations! I’m so happy I could bring some joy to cooking for you, Kim! I appreciate that. 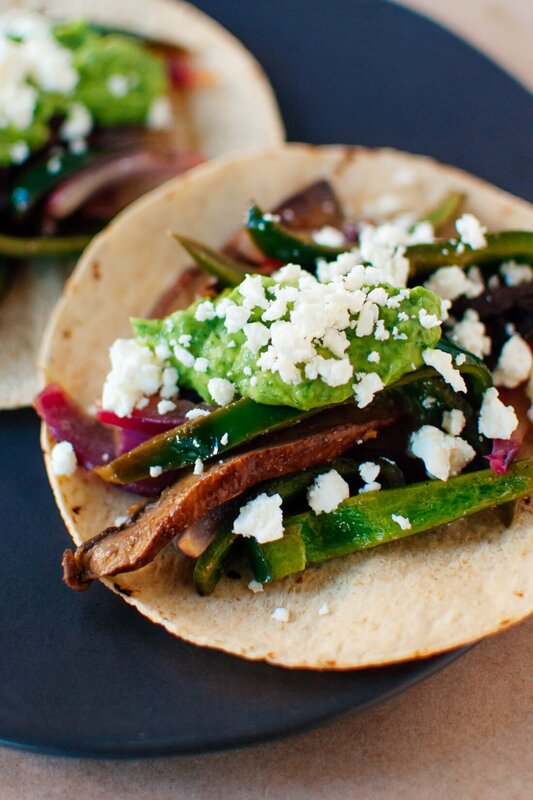 As a fellow Oklahoman, and lover of Pepe’s, Sweet Basil, and your blog, CONGRATULATIONS! I can’t wait to see your cookbook! Aw, thanks, Lauren! I’m so happy to have you here and can’t wait until you see the book. Eek! I just pre-ordered your gorgeous book from Amazon! I can’t wait to admire each page! Congratulations, Cookie & Kate! Thank you, Madeline! I can’t wait for you to see it. Random comment: I don’t follow many blogs on a regular basis but I check yours weekly. :) The recipes have always been successful and delicious. Also, I do love your videos! It inspires me to make one just for the fun of it! I’m sure you had to work very hard to make them seem so effortless. Really fun aspect to your website. I hope you do, Jean! And yes, that cookbook has Cookie *everywhere* in it. It wouldn’t feel right without her! Thanks, Courtney! I’m so excited for you to see it. I just pre-ordered your book from Amazon! I’m so happy for you and can’t wait to see what beautiful recipes will be in the book. Congratulations!!! Thank you so much, Michelle! I hope you love it. Congratulations on the book! 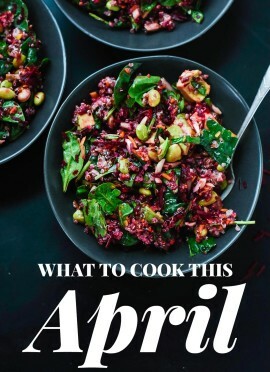 I just pre-ordered it and based on all the recipes I’ve tried from your blog over the past year, am sure it will be fabulous! And I hope it sells more copies than … oh let’s go with MJ’s ‘Thriller’. Congrats !!!! I wish you the best because you deserve it!!!! Thank you for the monthly inspiration!!!! 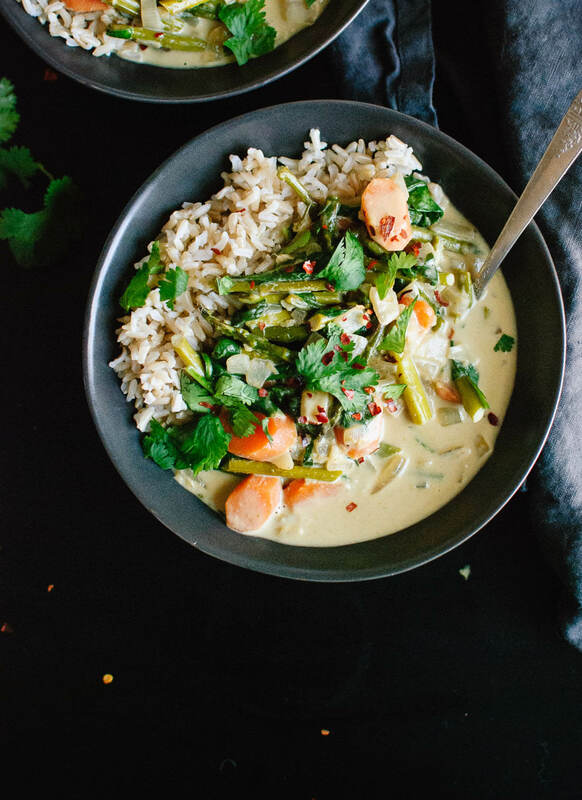 Kate, I LOVE green curry and am super excited to make this over the weekend! I also just pre-ordered your book and am so thrilled for you that this is now a reality! I’ve been reading your blog for years and am excited for whatever may be next for you. Thank you for your hard work and dedication to providing healthful content on your page and now in your book. Can’t wait to get it in May! Katie Beth, I owe you a belated thank you for your kind comment! Thank you so much for pre-ordering. Delighted to hear that you’ve been enjoying my recipes. I hope you LOVE the book! xo! Such a great list with so much inspo! My cookbook shelves are full, but clearly one of the books is going to have to be bumped since I just pre-ordered your book. Can’t wait! Congratulations–this is a HUGE (and delicious) accomplishment. Thank you, Catherine! I can’t wait for you to see it. Thanks, Maria! 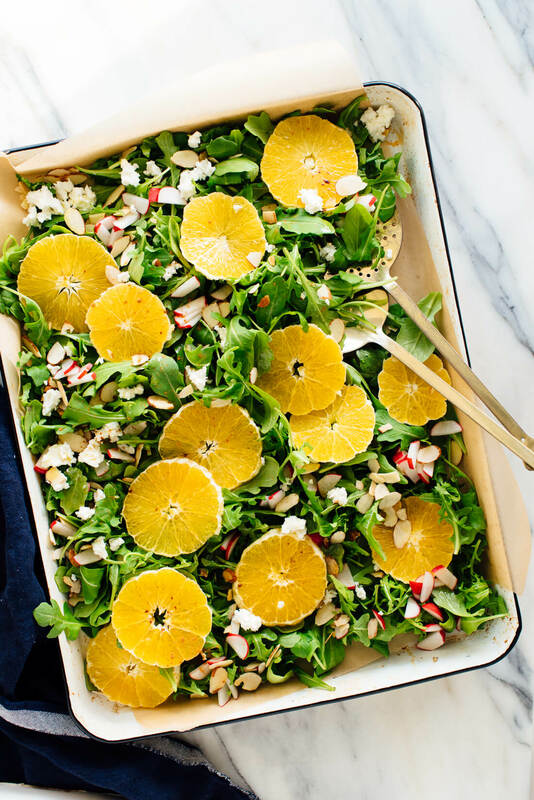 I hope this gave you some springtime cooking inspiration. Thanks for this list! I’m always wondering what foods are in season, and I love your list of recipes. You’re welcome, Karen! I hope it inspired you. Congrats on your book and all your hard work! Love that it is under $15.00. All your recipes I try are delicious. Thanks, Theresa! It was really important to me that the book itself and the recipes inside were affordable and accessible. So happy you found my blog! So excited for your book, Kate!! I can’t wait to get it…. I really love real cookbooks over printed recipes. I haven’t bought a new cookbook in years. Yours looks amazing! NONE of your recipes have failed me yet on your blog. I’m pre-ordering :) Congratulations on all your hard work! Thank you, Amy! I can’t wait for you to see the book. 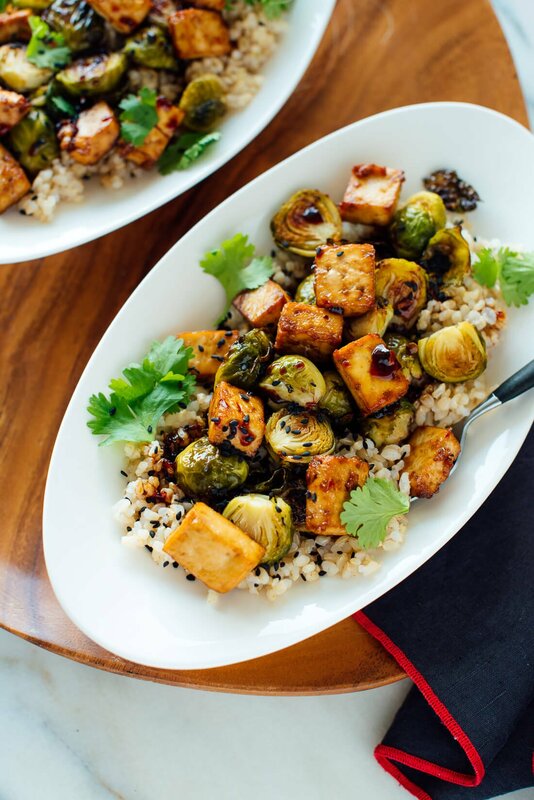 I’ll only eat Brussels sprouts roasted, and they sound great mixed with crispy tofu! That and those cauliflower/lentil tacos…talk about a mix of my favorite vegan ingredients! Thanks for the ideas Kate! You’re welcome, Ashna! I hope you enjoy them! All of these produce ingredients are fantastic! Sweet potatoes, broccoli, Brussels sprouts, greens, and mushrooms have been my favorites thus far! Let me know what you think, Hayley! Mushrooms, sweet potatoes, Brussels sprouts, broccoli, cabbage, cauliflower, carrots, and cabbage are some of my favorites this time of the year! I need to try out more of your recipes–I did make a similar rendition on your Thai green curry and it was a massive success! I adore these posts! This one particularly made me very excited for spring to come! At my house we’re transitioning to a vegetarian diet, and it’s quite a change from the way me and my husband grew up. 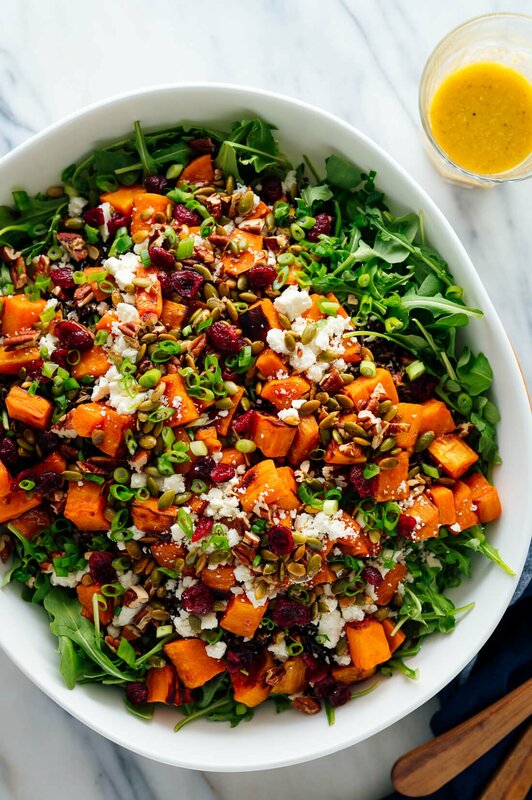 Its really important to us to be healthy vegetarians, and not just binge on Cheez Its and Oreos! That’s why we love your blog so much. Thank you for doing what you do! I know you read comments and enjoy getting ideas for what your readers would like to see, so I wanted to mention how much I’d love to read about what your grocery trips look like, what pantry staples you keep stocked, what you eat in a day, etc. !